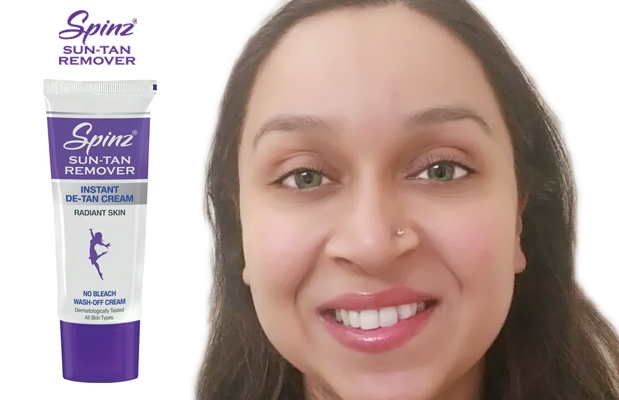 Indian Beauty Blog | Fashion | Lifestyle | Makeup | SparkleWithSurabhi : #SpinzBanTheTan - Spinz No Bleach Sun Tan Remover Cream! 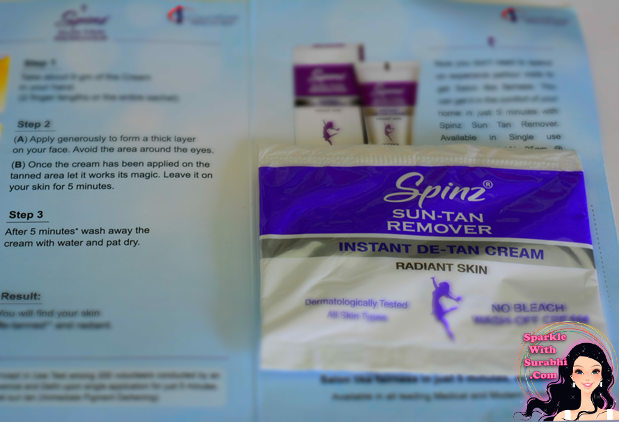 #SpinzBanTheTan - Spinz No Bleach Sun Tan Remover Cream! When I head out in the morning I normally prefer a top with three quarter sleeves but then it becomes tough if I have evening plans to switch to something light and sleeveless. Sunny days often lead to sultry nights and going sleeveless becomes an issue because of an uneven tan! That’s why I was overjoyed when I discovered Spinz Sun Tan Remover Cream. Now you can get rid of your Sun Tan within in 5 minutes with the Spinz Sun Tan Remover Cream which is Instant De-Tan cream. This is a Tan Remover Cream with no bleach, it is available for the Price of INR 89/- for 50gm and Single use sachets INR 10/- for 25gm and INR 49/- for 50gm. Spinz Sun Tan Remover is an advanced revolutionary formulation to instantly remove your tan, giving you soft and radiant skin. 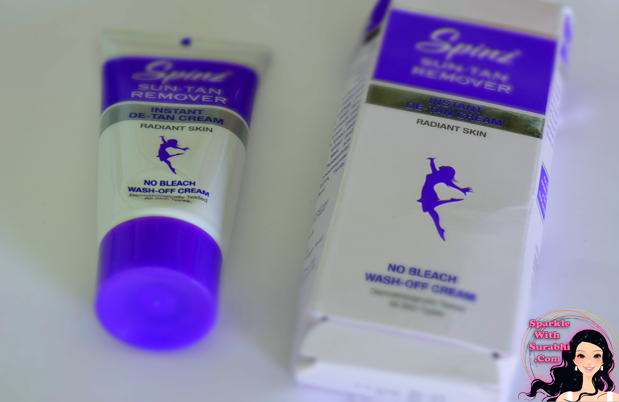 Spinz Tan Remover cream works , the best part is that it is non-bleach formula, if you hate applying bleach or you have extremely sensitive skin and bleach doesn’t suit you, then you can use is non-bleach formula cream instead. Imagine that you need to go a party and you really don’t have sufficient time to bleach at home or run to a parlour, just give yourself 5 minutes and apply this on your face for an instant glowing and bright skin. Even if you want to apply makeup, you have to make sure that your skin is radiant. I have come across a lot of women who do not apply bleach at all as they all know Hydrogen Peroxide is the main ingredient in Bleach. Many women are allergic and not comfortable using them or go for a facial wax. I applied Spinz Tan Remover for 2 days consecutively and yes, I have seen a difference in my complexion this does work, I noticed a new glow and a visible lightened complexion. This Sun Tan remover has been dermatologicaly tested too. This cream does not have Bleach and hence it will not lighten your eyebrows or facial hair like bleach based products. Can be used by men in the house too as it does not affect facial hair. It is an Instant Tan Remover, apply only for 5 minutes, it will help you to remove your tan and discoloration of skin which generally happens due to long exposure in Pollution and Harsh Sunlight. Wet your face with gentle face wash.
Once the cream has been applied on the tanned area let it work its magic. Leave it on your skin for 5 minutes. After 5 minutes wash away the cream with water and pat dry. You will find your skin DE- Tanned and radiant. The Pack is not very appealing even though the product is effective. The company should make the pack more attractive. Cannot be used to lighten dark circles under the eyes. It is very easy to use, just take about 9 gm. in your hand from the tube and apply it on squeaky clean skin. No activator or Pre-Bleach cream required. 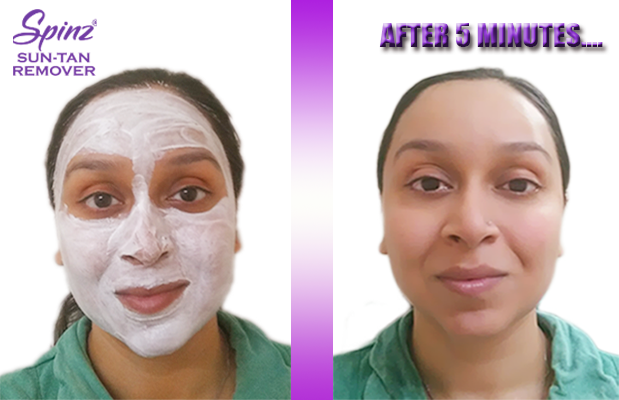 Apply only for 5 minutes as compared to 15 minutes traditional Bleaches. My skin is sensitive acne prone and the cream responded very well on my skin. I saw Instant radiance after washing. This cream will add glow and remove tan but does not bleach your facial hair so, in that case you will have to have to go for a bleach or facial wax. Spinz Sun Tan Remover Cream is a revolutionary new product in the market, no activators or Pre-Bleach Cream required just leave it on for 5 minutes and watch the magic, Instant Tan free skin. Love it!! It’s time to #SpinzBanTheTan ! great post! i loved the product too! Suggest me some online shopping sites .this is not available in Kerala.